This chart shows relative performance since the march lows, approximately 9 months ago. What makes me think that the new reversal will last longer than the small relative-performance reversal we had around May? As you can see in the chart, the current reversal is much sharper and decisive than the one we had around May. Smaller up-trends within the May reversal were still favoring IWN. In contrast, during the most recent black-line uptrend, DIA has outperformed not just during the sharp October correction (down market), but also during the following uptrend and market new highs, of November and December. 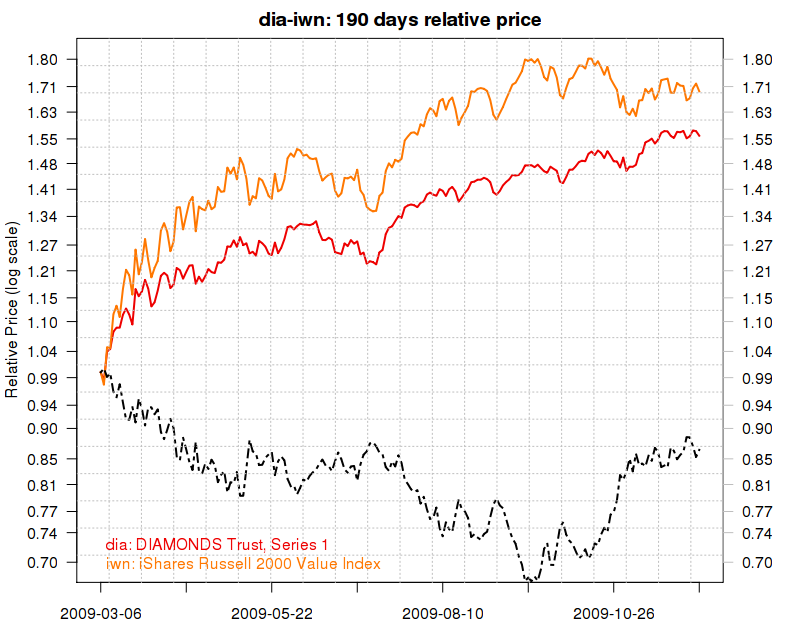 For effect, the following chart zooms in the new trend (42-trading days, i.e. past 2 months) where you can better see the out-performance in both up and down directions. During these 2 months, the gap between the two has grown from 0% to almost 9%, meaning the trade made about %9/2 = 4.5% on invested capital with much lower volatility/risk than the market. The thesis for this trade is that if the markets go south again, interest rates rise, or expectations of money tightening take hold, small-caps will be hit the hardest. If the recent developing change in the markets continues: large caps, strong balance sheets, non-US sales (exports), multi-nationals should be relatively strong, while small-caps, with less cash, more leverage, weaker balance-sheets, which are more dependent on the US (domestic) consumer, should keep under-performing in the coming weeks/months. This thesis is shared by big money managers like Jeremy Grantham of GMO ($100 billion AUM) who have great conviction and power to move markets. According to Grantham's recent (Q3 2009) newsletter, he has reallocated about 2% of assets from "high risk issues" to "high quality issues". Perhaps more significantly, if it just so happens, and the small-caps make yet another spike up, big money like Grantham and others is almost guaranteed to shift even more assets from small caps to large caps. Moreover, small-caps greatly out-performed large-caps in the big rally from March to September. This trend has now decisively reversed, so they have a lot to give up. I expect the reversal to last for a while. Also note that in November, DIA (and other large caps) made new highs while the small-caps failed to do so. e.g IWN has peaked way back on Sep 23 @ 58.90 (intra-day) and is now much lower. Lastly, there's fear that the market has run up too fast since March 9th, and is now overvalued and vulnerable, as we just experienced with the Dubai default. One of the merits of this trade is that it should totally protect you from a sharp drop in case the market finally suffers a significant correction. 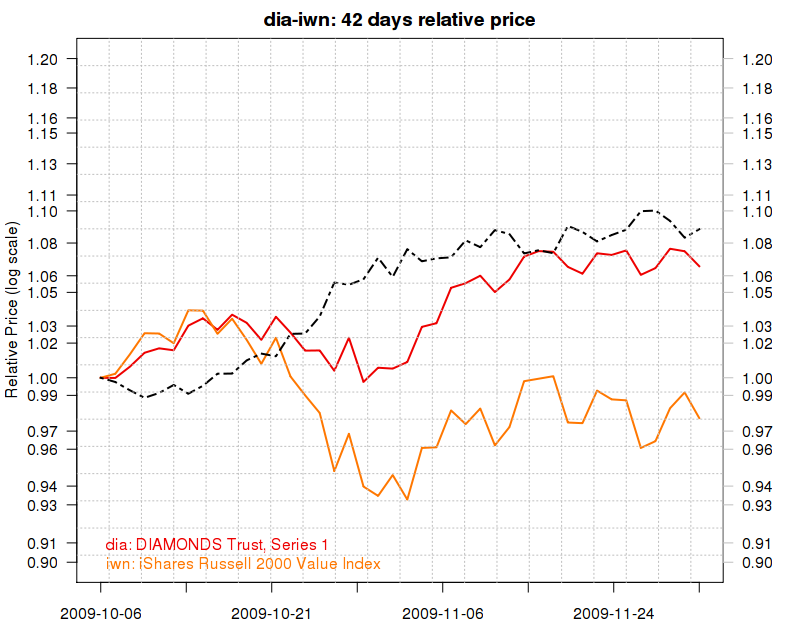 IOW: when the market drops, IWN is likely to drop much more than DIA and the trade should be positive. 1) This trade will not work if markets keep going up to new highs and euphoria finally manages to take small-caps to new highs, a feat which they have failed to achieve in the market highs of October, November and December. 2) Note also that despite the very high correlation between the two components of the trade, this trade has some losing days, in between the winning days, but it is pretty rare to see more than 2 losing days in a row. 3) Note that on up-days, small-caps often tend to outperform due to their higher beta. This is very confusing and would make you think this trade is "wrong" if you focus to much on the up-days instead of the overall picture (Also: see beta weighting below). A better way to execute this trade is to pay attention to beta: since IWN is roughly 25%-35% more volatile than DIA (this number has been growing lately), I shorted about 30% less IWN than I went long DIA. Other, very similar trades are go long IVW (Barra S&P 500 Growth) and short IWN or IWM, or IJR. An even better variant of this strategy, is to use UWM (a leveraged small-cap ETFs) in an even smaller weight, since it is daily-leveraged, and exhibits "volatility decay" over time. Unfortunately: I get the familiar "no shares available for shorting UWM" when I try to short it, which is another indication that the smart money is already in this trade. Here's a partial output of my pair-trade scoring utility based on a 40-day period, Open/Close prices, daily-regression analysis. Beta Weight is the weight of the second (short) component relative to the first component of the trade. Overall score is my own formula to rank pair-trades based on all the linear-regression analysis results. All the other columns should be self-explanatory. Every investor should make up his own decisions based on his risk tolerance, time-frames, comfort-zones, convictions, and understanding.